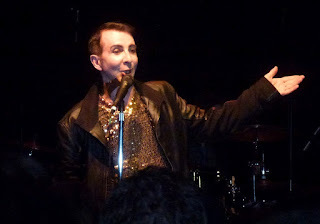 Last Monday was Marc Almond's 55th birthday and Dave had bought me a ticket to go and see him in concert at the Shepherd's Bush Empire in London's glitzy West London. Along with Dave we were joined by Darren, Paul and Simon - oh and 2000 other devotees. It was a tremendous gig. Marc was in good voice and obviously very happy to be there. The crowd loved it too - well, except Darren who hated it as did Simon (who left halfway through). One for the fans maybe? But that's who was there! Lots of self-penned work, a Northern Soul section and pleasingly few 'hits'. There were some great great reviews, notably The Arts Desk and The Guardian. @MarcAlmond: To those that enjoyed and appreciated the show thank you, you get it and understand.thank you for your cards and gifts. @MarcAlmond: All I all in my top 3 Me shows. Atmosphere,crowd, musicianship,songs,vocals,brass and BV's,sound,glitter canon,emotion,4 me gig perfection.